Ship emissions now remain the third largest source of air pollution in China, following vehicles exhaust and factory emissions. According to the Economic Information Daily, the emission of a ship that uses fuels with 3.5% sulphur discharge is tantamount to that of 210 thousand trucks per day. The pollutants contain dozens of toxic chemicals that pose critical damage to people’s health. Right now, China’s marine fuel quality lags behind that of major developed countries. Industry observers suggest the establishment of an inter-regional mechanism to jointly tackle the problem. Hong Kong is the first Chinese city to take strong actions against ship emissions, where half of air pollution was produced by marine vessels. In 2013, Hong Kong chief executive C. Y. Leung called for “green transport”, requiring vessels to use low-sulphur diesel in the Pearl River Delta ports. Meanwhile in Shenzhen, over 100 container vessels from 15 shipping enterprises have participated in a project aiming to subsidize ships using low sulfur fuel or shore power. In June, Chinese authorities said it was considering a new standard in regards to the country’s marine fuel quality and usage. Last year, China rolled out its Air Pollution Action Plan, declaring a war against the country’s long-existing air pollution problem. Do the new regulations on berthing ships in Hong Kong go far enough to curb pollution? Sulphur pollution near one of Hong Kong’s busiest shipping lanes fell markedly in the first week of this month as a result of new regulations mandating ocean-going vessels switch to cleaner fuel, according to the Clean Air Network. Average 24-hour concentrations of toxic sulphur dioxide (SO2) in Kwai Chung were recorded at 12 micrograms per cubic metre of air between July 1 – the day the mandate went into effect – and Tuesday. By comparison, the average 24-hour SO2 concentration in the same period last year was 34 micrograms per cubic metre and 23 micrograms per cubic metre the year before that. The new rule requires all ocean-bound vessels from tugboats to container ships to switch to 0.5 per cent sulphur marine fuel when berthing in the city. Kwai Chung, which together with Tsing Yi forms Kwai Tsing district, is located near the Kwai Chung container port – the world’s fourth biggest in terms of throughput. Previous studies have found the area to be the worst hit district in the city from ship pollution. Ships are the biggest source of SO2 in the city, followed by power generation. In terms of roadside pollution, average levels of nitrogen dioxide, suspended particulates and ozone all dropped in the first half of the year. But average concentrations of microscopic particulate matters suspended in the air, or PM, rose in Tuen Mun, Tung Chung, Causeway Bay and Mong Kok in the same period. Particulates can penetrate into the lungs and cause respiratory and cardiovascular problems. All five major pollutants measured at 11 out of 15 of the city’s air quality monitoring stations exceeded the World Health Organisation’s guidelines. Other than in Kwai Chung, Kwun Tong and Tai Po, concentrations of ozone – an indicator of regional air quality –recorded lower than average recordings at all ambient monitoring stations in the first six months of the year. But the number of times ozone levels exceeded WHO guidelines over eight-hour periods rose at all stations in the same period. Hong Kong has taken another positive step in fighting air pollution. Since July 1, ocean-going vessels have been required to switch to low-sulphur fuel within local waters under a new law to improve air quality. Emissions of sulphur and respirable suspended particles of 10 microns or less are expected to fall by 12 per cent and 6 per cent as a result. The health risks for those living near container ports and coastal areas will also be lowered. Credit goes to the government and environmentalists for making this happen. 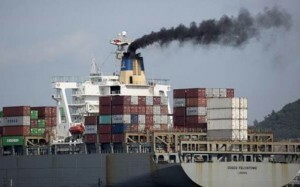 Emissions at sea are known to be a major cause of air pollution. Yet weak marine shipping laws mean the problem has not previously been dealt with seriously. It was not until recent years that vessels were required to switch to less-polluting fuels while berthing in the city under a pilot scheme. This became mandatory under the new law, which allows for a maximum jail term of six months and a HK$200,000 fine for non-compliance. But air pollution knows no boundaries. Just like the need for collective efforts to keep the neighbourhood clean, it does not help when other cities in the Pearl River Delta are not doing their part. It’s time we convinced our neighbours to do the same and adopt a region-wide fuel standard for vessels. That would mean establishing an emissions control area, within which vessels have to use low-sulphur fuel. The importance of getting Guangdong and others on board to improve air quality has long been recognised. The joint emission reduction targets set out in the Hong Kong-Guangdong Cooperation Conference, a forum on cross-border issues, are an example. Indeed, the issue of reducing emissions by vessels in the delta region was raised at the conference a few years ago, with both sides pledging to further explore the feasibility of adopting joint fuel standards. Now that we have made efforts to clear up our skies, the next step is to urge our neighbours to follow suit. This is not just for Hongkongers, but also for the tens of millions of people living in the delta region. If you commit your energies to protecting the oceans, it helps to live close to the sea. That’s how Toronto-born Lisa Christensen found her calling growing up in a small town on the US east coast, where she developed a healthy respect for nature. She recalls a time of bliss. “There was nearly no pollution. The air, water and the beaches were all so clean,” Christensen says. She did. In 2000, she founded Ecovision, an environmental awareness group in which she also serves as chief executive. Christensen’s parents moved to Hong Kong in 1989 when her mother got a job at KPMG. She followed eight years later. She had her first experience with Big Wave Bay on Hong Kong Island but was later horrified to find it strewn with debris, some of which had washed ashore. The sight brought her to tears. “I have travelled with my parents to South America and Europe since I was young but I have never seen such a scene,” she says. Christensen went to beach clean-up events with friend Christine Loh, who would later become undersecretary for the environment and from whom she would learn about environmental issues. Christensen quit her job as a sports marketing professional to establish Ecovision, working with schools and shopping malls tor collect and recycle waste.“It was a decision made out of passion,” says Christensen. “My father has been my biggest supporter.” Not even SARS could stop her, although the 2003 outbreak seriously dented her recycling efforts to a point where many of her projects were canceled. After her father died of brain cancer in 2006, Christensen pressed on. And when her mother returned to Canada, she decided to stay in Hong Kong. “I love Hong Kong. It’s such a lovely, vibrant city,” she says. Later, Christensen realized Hong Kong was not ready for recycling because people lacked awareness. Christensen has recently introduced Zero Waste Week to Hong Kong businesses to promote reduction of plastic and paper waste. “Zero waste is achievable,” she says. She cites a San Francisco resort which has cut waste production by 95 percent in 14 years, and the Slovenian capital Ljubljana which has been declared as the first city to adopt a zero waste policy, with more than 60 percent of its waste reduced by recycling. Christensen says Hong Kong should also set a target to end waste production. “I’m hopeful that Hong Kong will show a much higher level of environmental awareness,” she says. An anti-pollution law under which all ocean-going vessels must be powered by low-sulphur fuel while berthing in Hong Kong took effect yesterday, accompanied by calls to look ahead to the next step – pressuring other regional ports to follow suit. The city now makes it compulsory for berthing ocean-bound vessels to use fuel with sulphur content no higher than 0.5 per cent, lower than the international cap of 3.5 per cent. In return, shipowners save half of their berthing fees through government subsidies. The move is expected to cut emissions of sulphur and respirable suspended particles of 10 microns or less by 12 per cent and 6 per cent, respectively, according to the Environmental Protection Department – improvements in air quality that one think tank estimates will lead to 44 per cent fewer premature deaths each year. With the new law now in place, it is time to shift the focus to setting up an emissions control area (ECA) for the Pearl River Delta region, said Simon Ng Ka-wing, chief research officer for the think tank, Civic Exchange. He said the region’s emissions data was being updated and would provide more justification for an ECA. Civic Exchange helped pave the way for a local Fair Winds Charter, launched in 2011. Under the voluntary scheme, 3,000 ocean vessels from 17 freight lines switch to low-sulphur fuel at berth each year, equivalent to roughly 10 per cent of total annual port calls. With the new mandate, all 30,000 ocean-going ships that berth in Hong Kong yearly must comply, the department said. Retired Liner Shipping Association chairman Peter Ng Yee-chun agreed a region-wide fuel standard would make things easier for shipping operators. If an ECA was the ultimate goal, he said, all ships in the region should adopt a consistent standard of 0.1 per cent sulphur in their fuel, the latest cap for recognised ECAs. This idea was echoed by Shippers’ Council chairman Willy Lin Sun-mo. “It would be much better for shippers, if Shenzhen or Guangzhou could adopt the same regulation for a consistency of regional standards,” he said. Subsidies to help the industry comply end in 2018, and the question is how to transfer the cost, eventually, to the consumer. Current oil prices make 0.5 sulphur fuel 20 per cent more expensive than regular heavy fuel. “All parties need to shoulder the cost burden,” Peter Ng said.